My mind defines me and if you like that interaction, then welcome to my narrative. This is Part 2 of me trying to framework myself with some gaming Aesthetics! If you didn’t catch Part 1, go check it out otherwise you may be quite lost. Now let’s carry on (my wayward son). This is very much not me. Even when I am playing against people in a competitive setting it is a very personal thing for me. Very rarely is my mindset about winning or losing. More often it is just about me feeling good with how I did under the circumstances. There is very little desire to express dominance. Thinking back on a lot of the competitive style games I have played, it was often a masking of fellowship. At the end of the day, many of my friends are not really gamers so to ask them to invest a chunk of time into creating a lasting and meaningful cooperative gaming experience (with a Tales game for example) would be asking a lot. So instead, it was always easy to sit back with some Melee or Halo, just for the sake of bringing people together. Thinking back on a lot of the competitive style games I have played, it was often a masking of fellowship. Go back and read what I just wrote about fellowship and then tell me if you think I am competitive. This is a big one for me. As opposed to many of the other Aesthetics on this list, this is something I will actively seek when considering buying a new game. I play games with a very “no stone left unturned” mentality and I love when there are more stones. The Mega Man Battle Network games are popping into my mind as great examples of discovery. The Battle Network games had a wonderful way of always having more. There was variety of battle chips, different interactions between the chips, secret worlds and bosses. It was so easy to get lost in these games and it was wonderful. Xenoblade Chronicles is another great example. The game was designed to be huge, immersive, and reward the player for caring about far off corners in distant lands. A love of Discovery could manifest in many ways, but for me it nicely parallels my love of academia. I have always enjoyed school and being in a setting of purposeful learning. There is so much to learn from the world and a school setting is a wonderful way to embrace that. A love of Discovery could manifest in many ways, but for me nicely it parallels my love of academia. I lean more heavily on this Discovery of the mind side, but as I said, this propensity towards Discovery could manifest in many ways. For example, world travelers are embracing that physical discovery you may see in many Western RPG. Expression seems oddly defined by “game as self discovery” in the article which does not match the passage that goes on to describe the Aesthetic. I’m going to consider both the phrase and the passage here. “Game as self discovery” is the nearest to a 4 word description of what I write about here in Gamer’s Eye. Learning who we are through games. I think that if I did not say this was big for me, the credibility of this blog would be shot on the spot. Clearly, if I am writing bi-weekly posts about how games have helped to mold the person I am today, I care about games as Self Discovery. A recent stand out to me is the way Shin Megami Tensei 4 so brutally asks the player over and over again to pick between law and chaos, and somehow by changing the context of the scenario we begin to empathize with different paths and question our own thoughts. Beyond this, it becomes a bit of a meta moral decision as I question what I want to go for in game and what I accept as my moral position out of game. That is what I pick up when I read “Game as self discovery”, but then the passage in the paper, as well as Extra Credits’ explanation, take the Aesthetic in a totally different direction. They both go on to describe expression more as an Aesthetic that relates to the ability to express yourself through the game. For example, games where you choose your class, equipment and looks or games where you are simply materializing your mind through game creation like Minecraft. I think there is a very tenuous thread that could try to connect these two definitions but it is shaky and esoteric at best. To me, these are fundamentally different, most evidently to me because I am 100% a gamer for self-discovery and in no way a gamer enthralled by imparting myself upon the game. At the end of the day, I think that “Game as self discovery” can really be found a little in every category (hence why considering this framework as a personality test even makes sense), but it is often most captured in the interaction of fantasy and narrative. Fantasy puts us in a position we may not normally be in, and Narrative asks us to choose how we empathize with the characters that surround us. This is a powerful combo that forces us to question the unquestioned. Looking at what expression is apparently supposed to mean, as I said above, it just isn’t something I attach to that much. Not to be redundant but I think a lot of this comes back to that function over form kind of argument. In one of my posts on Fit vs. Complacency I talked a lot about how I really only care that a character feels right in fighting games, the look and story I am taking on matters very little. Games like Scibblenauts or Minecraft where creation is a key element have never grabbed and retained my attention. The same can be said for western RPGs where there is a lot of emphasis on character creation and crafting an in game identity. Let’s consider the parallels of this expression with real life. As with all of these Aesthetics, there are certainly many ways to think about expression, but I think expression maybe takes the cake here. It’s a little hard for me to pinpoint what it really means and every time I come up with something I start to contradict myself a little. The way I see it though, it is a little bit like what is left in the essence of choice when you strip out Narrative. Narrative is the plotline choices and Expression is the rest. It’s the bit that adds personal flair to main story. I have generally never cared about how I express myself to the world in most facets of life. My clothing choices are mostly a hodgepodge of arbitrary outfits that I have picked up over the years. I have to force myself to care somewhat about appearance in the corporate world because it’s a thing I suppose. It’s just hard for me grasp that anything beyond human interaction should matter. My mind defines me and if you like that interaction, then welcome to my narrative. On a more global scale, it seems so many people are worried about leaving their mark on this world. They want to be remembered for this great thing or that amazing gizmo. But again, here I guess I find myself apathetic to this. Any kind of memorialization I could hope for would stem from that world of narrative. It would come from the smiles of intertwining stories, not some grand legacy of the BRAND OF DYLAN. Any kind of memorialization I could hope for would again stem from that world of narrative. It would come from the smiles of intertwining stories, not some grand legacy of the BRAND OF DYLAN. That is just my first pass at understanding expression for me. This may change if I think back on this down the road, but at least for now it makes sense to me. This is a curious category to me. I think to some extent it is relevant to all gamers, but it is the category that makes me cringe the most as a gamer. It’s hard to admit that I am doing something for the purpose of passing time, but at the same time I admit that there is value in the escapism and recognize that this is a part of gaming for me. I think there is good and bad abnegation. To me, good abnegation is when the Aesthetic is used to buttress another Aesthetic. For example, in Pokémon, time spent just for the sake of passing time is often supporting this combination of fantasy and discovery. We are wandering through this world trying to become the best. That dedication takes time and investment. On the other hand, I think the style of games that I got into most which are quintessential representations of bad abnegation are Online Collectible Card Games (I played Tyrant and Legacy of Heroes). Ultimately, these replace the money in traditional trading card games with time… and money. At least the ones I have played have been crafted in the way they create a poor time investment to deck building ratio; beyond this, if you don’t spend actual money there is no way to be competitive. They have quite a clever money making model. You enjoy the discovery of new cards early and interesting deck building with their story mode. Then whet your appetite for the bonuses of paying money by giving you slight opportunities to get free money. Next, people hit a wall in the story and turn heavily towards PvP where 3-4 strategies quickly become omnipresent and breaking that mold requires one or many paid for cards. Finally, repeat the cycle all over with new story mode missions. The concept of abnegation makes me cringe a little because to many, this seems to have become a bit of a rallying call for the value of gaming. People talk about how destressing by passing time somewhat mindlessly in a game is a wonderful benefit. The concept of abnegation makes me cringe a little because to many, this seems to have become a bit of a rallying call for the value of gaming. While I don’t wholeheartedly disagree, I think it’s not the best rallying cry. There is so much to learn from games, and using this rallying cry is like presenting the anti-gaming community with a straw man to beat down on. When they are arguing we are wasting our time, I feel like the best counterpoint is NOT “But wasting my time can be good!” Just my thoughts. So there you have it! 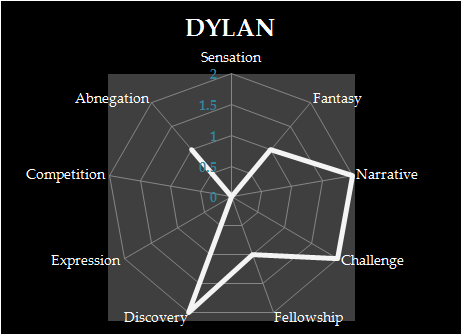 These are the ideas behind the radar chart of Dylan Connor. I meant to go a little more into direct real life parallels, but I think they are in many cases easy to draw, and in other cases will continue to reveal themselves as I write for this blog. Thus, for the sake of this not becoming the beginning of a dissertation, I think I will just let the parallels shine through in stories to come! Let me know what you guys think! Do you have a go-to framework that you prescribe to? And do you think there is value in trying to understand yourself through these various tranches? What do you think about the MDA framework? I think seeing the MDA categories laid out helped me a lot. I had questions about how I play games that didn’t seem easy to answer, but now make more sense. For example, I dislike ‘grinding’ in games, and frequently run away from battles (or try to, even when it seems easier to fight on autopilot), but I will sit in an area and spend hours trying to catch a certain pokémon, or get a pin drop in The World Ends With You. It was hard to tell if it was the game, the battle system, my mood… But thinking of it as abnegation, I agree with you that I like abnegation while striving for another purpose. Forced abnegation when I’m not in the mood for it ends up detracting from my experience as I feel that I’m playing in a sub-optimal manner, or just not playing the right game for me. Narrative and fantasy are another set of things that can easily be lumped together, but explains why I enjoy something like Skyrim in a very different way than I do Final Fantasy. It has also shown me why my love of ‘the story of the world’ (involving lots of discovery) feels so separate from my love of ‘the story of the main characters’ (narrative). In a game like Golden Sun I might not think the characters are the most fleshed out, or the dialogue the sharpest, but when I can check every oven to see what the local specialty is, or read everyone’s minds and compare that to what they’re actually saying, and piece together what each city or continent is like from the various people’s daily lives and beliefs… Well, you can see I find it exciting. Anyway, ramblings aside, I enjoy this system both for helping me, as a player, to define what makes a game interesting for me, and for helping me, as a budding game writer/designer, to define what the core experience of our games is, who it will appeal to, and make sure we are on the right track. Thanks for posting! I’m glad you are thinking about the different distinctions. Writing these 2 pieces as well as thinking about the weekly Playing With Aesthetics has definitely been interesting for me thinking more heavily how I interact with games, and how that relates to life. I also think it is important to continue to always question the framework. If things don’t fit well, consider if there are missing subsets or new ways to think about the interactions. I like how you broke down the different elements of what is generally funneled into “grinding” and thought about what makes one bland to you and one exciting! That’s been my experience, anyway, since I’ve been mocked my entire life for my love of gaming by my non-gaming sisters (but, interestingly enough, they’ve never made fun of my brothers for it…but I digress, that’s a whole other topic XD). Sorry for the late reply, I posted about 10 seconds for heading off to a plane for a vacation. Thanks for the comment! Yeah, we have a pretty supportive family but have been on the receiving end of our fair share of insinuations of gaming being a meaningless waste of time. I think it is generally getting more accepted but still needs some time. If I am on a bus playing my 3DS I can be pretty sure that I will be amongst the last people to be sat next to (along with questionable ax murderers and no hygieners). Where if I am crocheting, someone instantly sits down and often strikes up a conversation about what I am doing (which I am terrible at!). It’s always just weird to me to consider how people perceive the gaming.